Lulu's Garden: Jamie and the Giant Sunflower! Plants are wonderful. They come in all sorts of shapes, sizes and colours and sometimes you are never quite sure what you are going to get. At garden shows across the country there are competitions for the largest plant so we decided to have our own Vialii competition and to make it even more fun me and my friends are used to measure the super-sized plants! 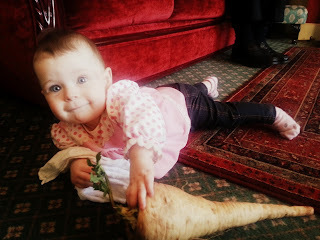 Here we have a super-sized parsnip grown by my very own Grandma. This parsnip was officially sized at "Two thirds of a Lulu". Now, we always thought it was Jamie and the Giant Peach but here we have Jamie and the Giant Sunflower! The official measurement is "Double a Jamie". Here we have a photo of my BFF Euan and a super-sized collection of tomato plants. 98 plants to be precise. We're gonna be eating tomatoes for a long time I think! The tomato collection is officially 147 Euans! Euan and the super-sized tomato collection. We'd love to see photographs of you with the super-sized plants you have grown so please email them to me.